The Architectural Photography Awards (APA) is seeking sponsorship and support as we enter a new phase of growth and exposure. The APA is a great opportunity to showcase your brand on a global scale while engaging with the architectural elite and manufacturers via the World Architecture Festival, which each year welcomes around 2000 decision making architectural professionals from over 65 countries. Depending on your level of support, benefits include marketing opportunities for your company, tickets to exclusive events and so much more! 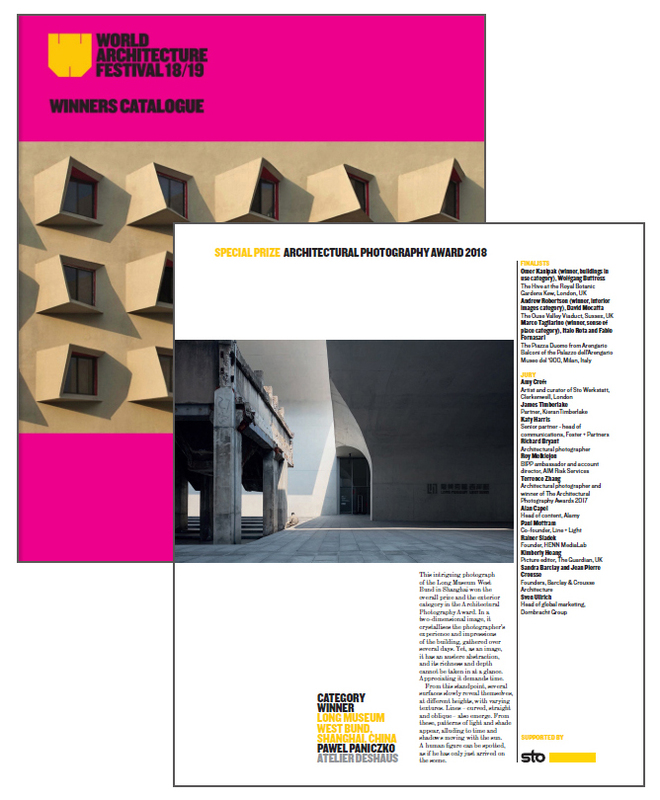 One of the benefits of supporting the APA: The Architectural Photography Awards page in the WAF/Architectural Review Winners Catalogue. The supplement reaches key influencer design professionals in 96 countries. The Architectural Photography Awards is open to everyone from full-time professional photographers to students, with subject categories designed to ensure that all elements of architecture are represented and captured. Since its inception in 2012, the APA’s momentum has grown each year with media coverage online and in global newspapers and magazines. Eminent figures, including architects Dame Zaha Hadid Sir Richard Rogers and James Timberlake, FAIA, Christine Murray, editor of The Architectural Review, Kate Goodwin, the Royal Academy of Art’s Head of Architecture and Valeria Carullo, Curator of the Robert Elwall Photographs Collection, RIBA British Architectural Library, have taken a seat on our judging panel. We have a range of sponsorship packages that can be tailored to your interests. Please get in touch with Lynne Bryant lynne@archphotoawards.com for more information.